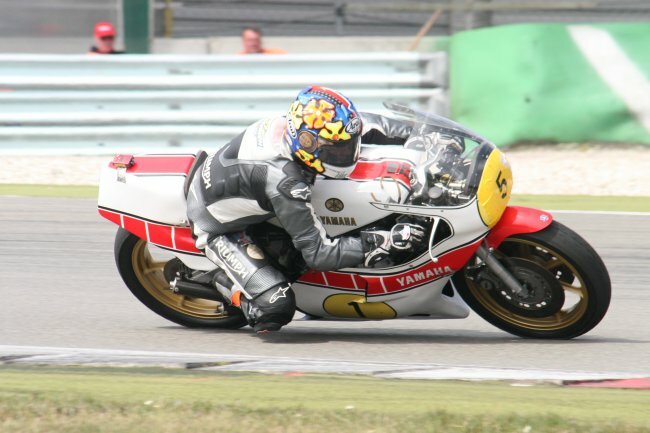 The former British 125cc Champion and up and coming TT star Cooper completed three sessions of twenty minutes each on the superb 0W45 (TZ500) Yamaha that he will campaign in new Formula 1 Classic TT Race on Monday 26th August, and posted progressively quicker lap times. Former works Yamaha mechanic Ferry Brouwer, now the Team Boss of Yamaha Classic Racing team, commented. "It was great to see the grin on his face and the enthusiasm and passion that Dan has for the bike. It looked like it was made for him when he went through the chicane with his chin on the tank." "We changed the gearing during the session which allowed Dan to go right through the gear box and I'm confident that the bike is now ready to race, apart from stripping the engine and changing the chain and brake pads, and we've now got it set up correctly for Dan." "My dad has been trying to give me advice on how to race a two stroke bike but he forgets that I was British 125 champion. It was great to get a feel for the bike which is a powerful machine to ride and having tested it I'm now looking forward even more to taking it round the Mountain Course." This year will be the final season for the unique team of legendary racing bikes and riders from Yamaha's golden era and the Isle of Man Classic TT meeting, which runs from 23rd to 26th August 2013, will be the team's final appearance.